On Saturday, November 22nd, 2014, Team Fastrax™ will be performing their patriotic American Flag aerial demonstration, as part of the opening ceremony for the East Carolina Pirates football game. The Pirates are a Division I NCAA football team in the American Athletic Conference. We are honored to be performing our American Flag skydive on such a meaningful day at Dowdy-Ficklen Stadium. It’s so important to appreciate and acknowledge the men and women serving in our military. The East Carolina University football game vs. the Tulane Green Wave is sure to be an unforgettable day. The game can be viewed on ESPN, and will take place on Saturday, November 22nd, at Dowdy-Ficklen Stadium in Greenville, North Carolina. The game starts at 3:30 p.m., and this week is Military Appreciation Day at the stadium. 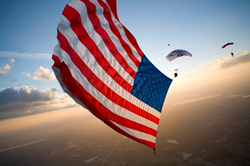 Prior to the game, during the National Anthem, Team Fastrax™ will be performing a patriotic American Flag skydive along with a very special skydiving game ball delivery. According to the Pirates’ website, all five branches of the United States Armed Forces will be welcomed, recognized and thanked at Dowdy-Ficklen Stadium on Saturday for Military Appreciation Day. East Carolina fans will also be able to enjoy many patriotic activities, including an up-close look at military displays and participation in a first-ever card stunt. As part of its annual "Tickets For Troops" initiative, over 6,500 tickets have been donated to active military members stationed around the region at Camp LeJeune, Fort Bragg and New River Air Station. In addition, National Guard members and veterans living at the Wounded Warrior Project were also invited to attend the game as special guests. Team Fastrax™ is sponsored by Selection.com®, a leading provider of criminal background checks and pre-employment screening services. They are the most ambitious professional skydiving team in the world. The parachute demonstration team has a roster of more than twenty-nine active members, with a culmination of more than 300,000 skydives. Team Fastrax™ has performed exhibition skydives all over the world for audiences large and small as a patriotic display or as a product promotion. For more information and to purchase tickets, visit the East Carolina Pirates’ website.